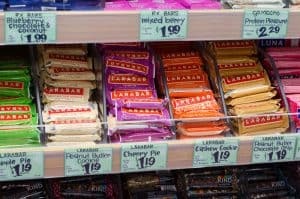 I remember my first few times shopping at Trader Joe’s – I went in, wandered around, wondered where all the brands I knew were, bought a few random snack items that had been strategically placed in order to capture my eye and my wallet (which were clearly well done, since I bought them), and went home still in need of actual groceries. 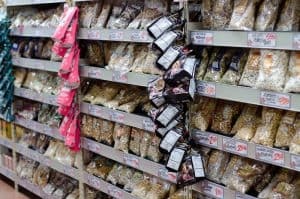 Now that I’m more familiar with the Trader Joe’s brand and their store layout, it’s actually one of my weekly go-tos. 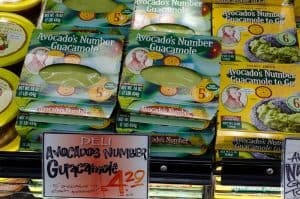 And if I’m doing a Whole30, a lot of their products cannot be beat for convenience and value. 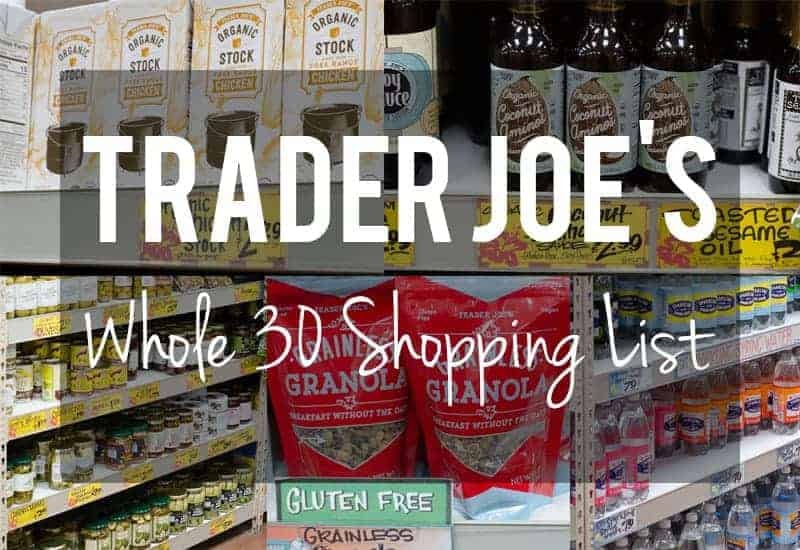 Keep in mind, I didn’t photograph everything – I just did a quick once over, highlighting a few of my favorite products in the photos, but each section will list a lot of the Whole30 goodies to be found at TJs. And as always, if your store has something that’s not listed here, share it in the comments so everyone can benefit from your nugget of knowledge! 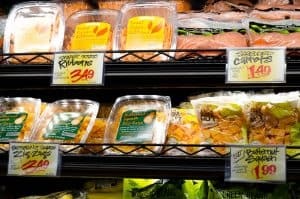 When it comes to pre-prepped veggies, Trader Joe’s takes the cake. (Ugh, I know, why am I referencing cake when you’re on a Whole30? Stay the course – I promise there’s no actual cake in this post.) Anywho, in the fresh section, there are a ton of options. 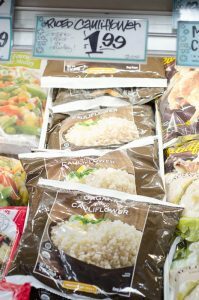 They have pre-riced cauliflower, which I buy and use in both my Buffalo Chicken Casserole and Chicken Bacon Ranch Casserole, as well as pre-riced broccoli. 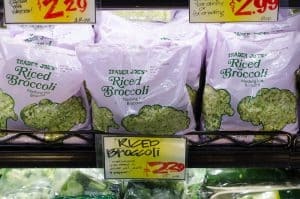 I’ve never actually riced broccoli on my own, but knowing the mess the cauliflower makes, I’m happy to just buy this one in a bag. They also have a number of other pre-cut vegetables that I’m grateful that someone else cut up. When you’re on Whole30, the food prep and meal planning can get overwhelming. The fact that I can buy peeled and cubed butternut squash in a bag is a game changer on the hard days! 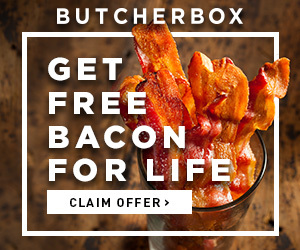 I’ll dump a bag of that on a sheet pan with some sausage and a diced onion, bake it, and call it dinner. 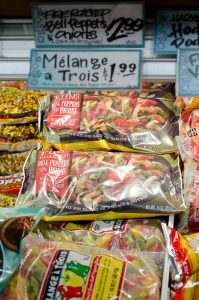 They do have basic things like shredded carrots and chopped mirepoix (thats onions, carrots, and celery, for those of you who are common folk like me and don’t speak French :D), but they also have fun things like sweet potato ribbons, butternut squash zig-zags, and other ways to liven up an otherwise boring meal. 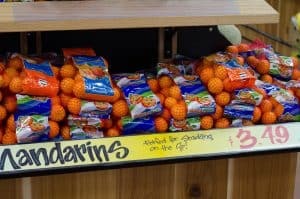 The best part is they’re all grouped together, in the fresh produce section, in bags. Again, they’re not all pictured here, but there are all the basics – chicken, pork, beef. Their prices on whole chickens are pretty good. Above are my 3 favorite go-tos in the Trader Joe’s meat section on Whole30, though. 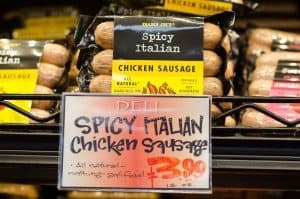 Two chicken sausages: Spicy Italian, which are pre-cooked, and Sundried Tomato, which are not. Be careful, there are other flavors of both of these types of sausages, and none of the other flavors are Whole30 compliant. 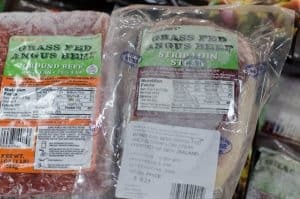 They also have grass-fed beef in the frozen section – both ground and strip steaks, neither one with the outrageous price tag you might find on grass-fed beef at other grocery chains. 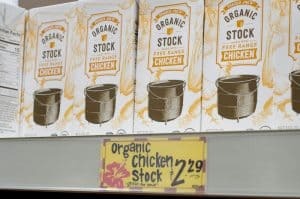 My favorite part about this category in Trader Joe’s is that it seems like they’re always coming out with something new. They pay attention to trends, and then release a less expensive version of something that everyone is currently buying. Example – coconut aminos. For as long as I can recall, the only coconut aminos I was able to find was this one by Coconut Secret. With that price tag, it’s not really a sustainable option for the long haul. 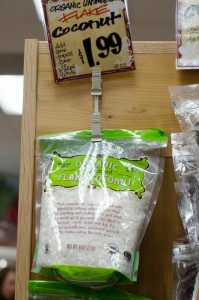 Trader Joe’s to the rescue, though, with their new organic coconut aminos touting a $2.99 price tag. Yes, please. 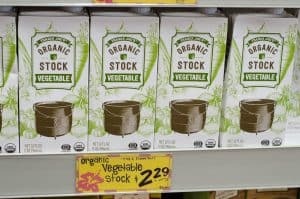 They’ve also recently released an organic vegetable stock and an organic chicken stock, neither of which have added sugar, and their ingredients are all Whole30 approved. I know everyone recommends making your own, which I do often, but let’s face it, you don’t always have that kind of time on your hands. When you’re already doing this much food prep, having pre-made stock is a beautiful thing. 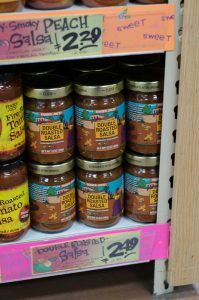 Other favorites in this category include coconut flakes, nut butter (they have lots of almond butter options, but the cashew butter is THE BEST), and salsa with no added sugars. 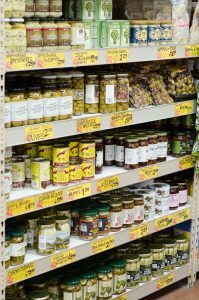 They also have a wide selection of jarred pickles and olives, which are great for snacking or toppings, as well as any kind of nut you could imagine – and they come raw, roasted, and salted, depending on your preferences. 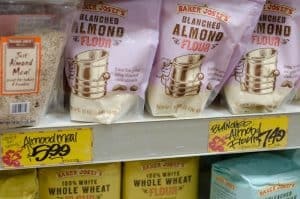 Last but not least, they sell both almond meal and almond flour. While we’re not doing any baking on Whole30 (that falls into the SWYPO category!) you can use this for a lot of other things. I know, they always say you’re not supposed to “snack” on Whole30. But sometimes, you’re caught up in the daily hustle, can’t make a real meal happen, and need something to eat. Having something that’s W30 approved on hand can be a lifesaver when you’re stuck in a land with vending machines as far as the eye can see. Tuck one of these into your purse/car/bag/murse/diaper bag/whatever suits your fancy, and you’re golden during snackmergencies. 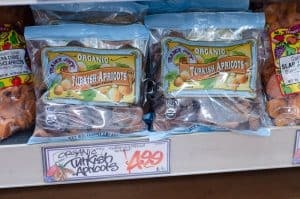 Some of my Trader Joe’s favorites here are their organic Turkish Dried Apricots, their Grainless Granola (I just eat a handful! ), and the trusty old Lara Bars and Rx Bars. Obviously watch your dried fruit consumption, as they are just concentrated sugar, but can be handy in a pinch! I’m a big fan of the sauce on Whole30. Sauces can make or break a meal, and they can add a ton of flavor to an otherwise bland dish. 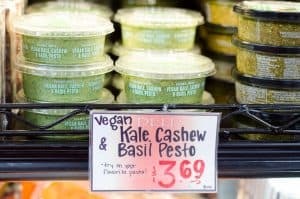 Trader Joe’s has an awesome Kale, Cashew and Basil Pesto sauce that I’ve used on zoodles before, or even just tossed any random veggies into. 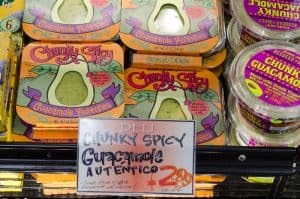 They also have pre-made compliant guac – a spicy one and a regular one! Try these with some (homemade) plantain chips, or some cut raw veggies if “chips” are too much SWYPO for you. 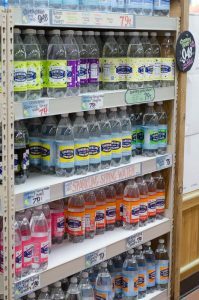 Almost all of the beverage and juice options at Trader Joe’s are a no-go on Whole30, but their seltzer selection is great. They have plain, but also a huge variety of other flavors, and are only 79 cents a bottle. These can help jazz things up when water gets boring, and LaCroix is too expensive! I also put together a quick printable for you, with ideas of things to look for in your Trader Joe’s. Even if they don’t have the exact things on the list, it will give you some ideas of where to look and what to look for. Happy shopping! 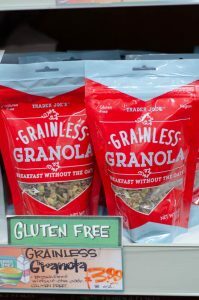 Something at your Trader Joe’s that’s not listed here? Share it in the comments for everyone! Enjoyed this post? Be sure to also check out our Top 10 List for on-the-go Whole30 snacks, Tips & Tricks for an Easy Whole30, Whole30 Q&A, Aldi Whole30 Shopping List, and our Costco Whole30 Shopping List! Thank you for all the helpful information you provided. I am about to start the Whole30 and you made it so much easier for me. Hi Dell, you’re very welcome! I’m glad it was helpful. Aren’t the grain products and snacks off limits on Whole 30? Mini-meals (protein+vegetable+healthy fat) like guacamole/pesto, carrots or celery and a protein – beef jerky/hard boiled eggs sound more on-plan. 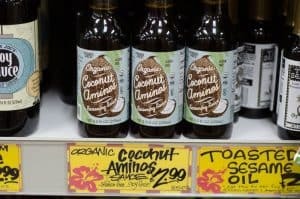 Did you try the coconut aminos? Awful, just awful. Huh…I’m sorry you didn’t like them! I haven’t had any issues with them from our store! Andre, I thought I was the only one! They’re terrible. It doesn’t taste like soy sauce at all, not even close. But Jessica, thank you for the awesome list; it’s been very helpful. Haha, guess I need to taste the aminos by themselves! You’re quite welcome Nina, glad it was useful. 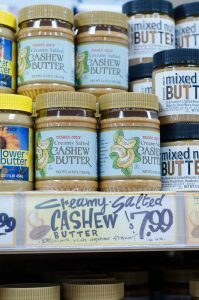 Do you have any suggestions for what to put the cashew butter on and salsa we are able to eat since we can’t have grains? As for the salsa, you can put salsa on most anything. I put it on top of eggs with my sweet potato breakfast hash recipe, add it to my beef taco casserole recipe, or just make your own plantain chips or similar and dip ’em like tortilla chips! Just as an FYI the Sundried Tomato sausage has turbinado sugar in it. Hi Gia! 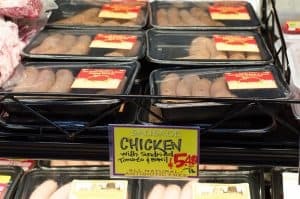 The uncooked Sundried Tomato sausage at our Trader Joes don’t contain any added sugars of any kind, which is why I included them in this list. 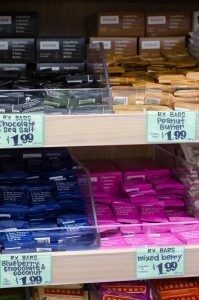 Different stores carry different items, which is why I always tell people that reading your ingredient labels is the most important part. Sounds like your store might carry a different variety than ours. Thanks for letting other readers know so they can be sure to check their ingredient labels also! You’re so welcome, Renee! I’m glad it’s helpful. Stay strong through your Whole30 and let me know if you have any questions, I am here to help! Jess! I just discovered their Green Goddess Salad Dressing in the refrigerated section, it’s delicious! Vegan and no added sugars that many brands sneak in there. Go try some if you haven’t already! I know! It’s so good. I’m working on a DIY version of it ! Hi! Is the chile lime seasoning whole 30 approved? Hi Suzy – it’s not. The ingredients have “rice concentrate” listed. 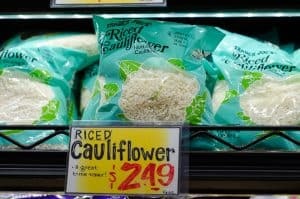 This is likely just to keep it from caking, but rice is a grain, so it’s a Whole30 no-go. You could easily make your own chili-lime, with some chili powder, lime zest, salt, and fresh lime juice while on W30! That’s what I thought, but just wanted to confirm! You are awesome…thanks!!! Was wondering about the green plant juice. I did t see anything on the ingredients that showed added sugars. Please let me know. Hi Gloria! I’m not familiar with the green plant juice. If you can send me the ingredients, or snap a photo of the label, I’d be happy to take a look!